Whilst raising a family and also holding down a full time job, what appears to be a blessing in the form of Holidays can often turn out to be just as busy as a normal working week. Amidst the scattering of food crumbs in the kitchen, glitter on the table from card making and toys all over the bedroom, having family over to stay or entertaining the kids could potentially lead to a very squashed household with little room to spare to accommodate guests to sleepover. There are a few solutions to this situation, depending on what type of visitor you have. If you’re on a budget and your little ones have invited over the cousins to stop overnight, a cheap and practical bed solution would be a foam cube bed. These handy cubes double as a chair/stool as well as flopping out into a single bed perfect for kids up to the age of around 12. Look to buy a color that would hide dirt the most – sometimes black is not the best color, a chocolate brown or tan color could be a better choice! For older children a larger foam chair bed, or a double sofa bed would be a good consideration. With the low weight of a foam type filling, these fun furniture items are both practical and modern, as well as providing a comfortable sleeping area for teenagers and light adults. If a sofa bed is for a newly decorated child’s bedroom, select a color that would suit changing tastes as the years go on – a classic navy blue for a boy, and a lavender or pink for a girl. Bunk beds and mid sleepers are very reasonably priced beds for small rooms where space is a premium. Look for a bunk bed with a changeable ladder and that also splits into 2 single beds should the need be required in the future. Mid sleepers are great as an alternative single hi-rise bed, with space underneath for a chair and a small desk for studying and storage. If you choose a standard pine wood, one idea is to paint or varnish the frame to match the bedroom color scheme. When thinking of space saving adaptable furniture for a living room, futons are a very popular choice. There is a huge variety of futons on the market and the outlay to buy a new futon is economical when you consider how many years you will own one. Whether your taste is for a solid pine wood base, or a sleek silver metal frame, one of the biggest benefits of a futon is the fact that you can replace the mattress whenever you feel like it. Depending on whether this will be for occasional use as a bed, and more as a sofa, or vice versa, take a moment to choose the mattress depth, around 9cm is a standard futon mattress depth, or look for a luxury thicker futon mattress around 14cm deep. Leather sofa beds. Upmarket residences with a minimalist interior design tend to choose a sofa bed with a covering that compliments the surroundings. Leather is always a desirable covering, and materials have developed so much in the last decade that these days you can buy a faux leather sofa bed and it would be difficult to tell the difference between that and real animal hide. 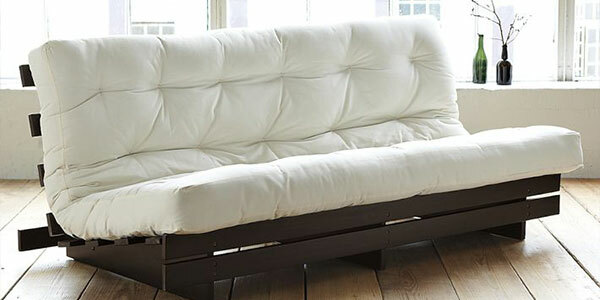 National department stores and online sites such as eBay and Amazon are great places to find a faux leather sofa bed. So, when Holidays come around this year, remember to be prepared for accommodating guests and visitors and choosing the right kind of dual-use seating and sleeping furniture right the first time round will save many headaches in the future.